We’ve been streaming both board games and miniature painting on our Twitch channel for months now but we haven’t taken the time to explore game streaming during our Podcast. Andrew and Amanda discuss what makes us watch games broadcast online. After watching the latest super hero flick to reach the local megaplex Andrew and Amanda decide to talk about games inspired in various ways by the super-hero genre. There are so many good games to discuss! Did you know that there’s a new Star Wars game coming out soon? Andrew and Amanda visit the Saugus location to get info from Jam. who is a little excited to say the least! Do you love Warhammer and other Games Workshop games? Are you looking for a part time job? 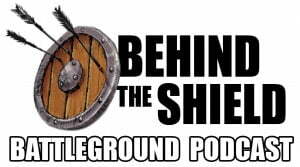 Battleground in Abington is looking to hire a Games Workshop specialist. Please visit THIS LINK for more details. Andrew and Amanda take some time today to talk about the vast array of different ways to expand on the games you love. There are so many expansions it’s hard to stop once we get started.